Carefully restored 1850's lighthouse boasts 3000 sf of living space including gourmet kitchen, library, 3 bedrooms and 2 1/2 baths. Interior opens onto 1200 sf of gorgeous deck and a four season sunroom. Easily move from indoor comfort to the beauty of the outdoors on Lake Superior's shore. Everything our guests need, from linens to top notch cooking equipment to a good read is waiting at the Eagle River Lighthouse. Bud and Jan Cole, a brother/sister team, hail from six generations of UP natives and lovers. Both share a passion for the history, pristine natural beauty and people of the Keweenaw Peninsula. Together, they work to restore historic properties to their full potential, incorporating old world charm with contemporary sensibility. Their appreciation of the area translates into a willingness to guide you to splendid trails and back country, historic venues full of fact and legend, and a easy place to enjoy a meal with friends and family at the end of the day. The Cole family spent summer vacations on Eagle River's shores. Fond memories birthed a desire to invest in the community. 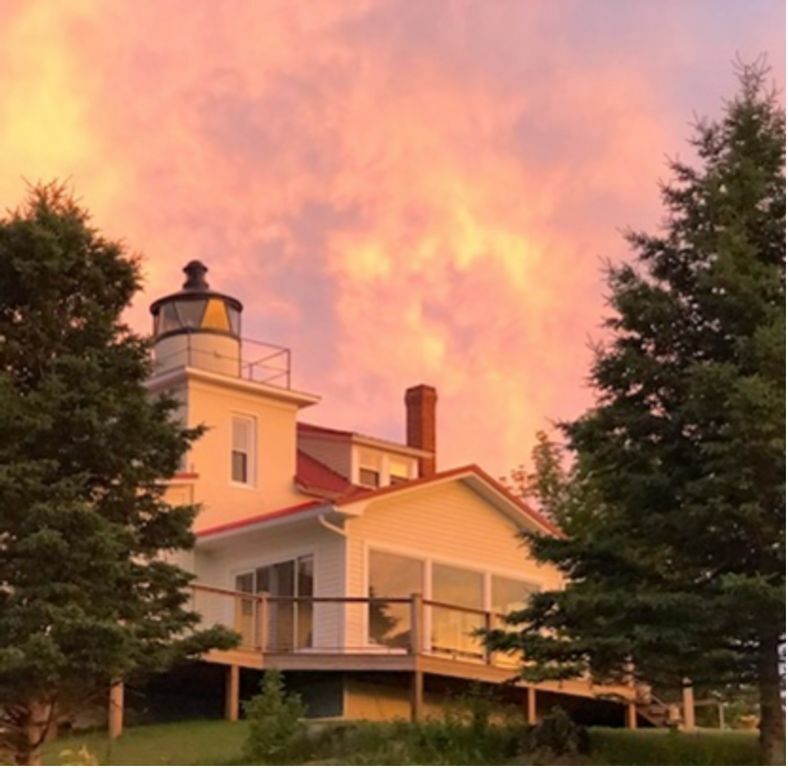 Once owned by their great great aunt's daughter, the Eagle River Lighthouse offered a rare and special opportunity to preserve a vital part of Eagle River's history while providing a venue for new families and friends to create special memories. The Eagle River Lighthouse is absolutely unique in its history and presentation. It was commissioned by the US Government to guide ships along Lake Superior's Keweenaw coast. Built in 1855 completely of red stone, it housed the light keeper and his family. The light was decommissioned in 1909 and the property sold into private ownership. The partners wanted to preserve the building's character and share its legacy as a beacon with others who treasure history and the splendor of lighthouses. Full baths offer large tiled showers, heated floors and custom vanities. Cooking oils, spices, sugar, flour, coffee filters, napkins, paper towels, soap, dish towels and cloths, sponges, etc. Beautiful well maintained and was exactly as advertised. Stayed at the lighthouse while in town for a hockey tournament for my son at Calumet Colleseum which was only a 20 minute ride. Two other dads and their 11 year olds. House handled all of us very well as there is plenty of space. Everything modern and updated. Kitchen large and friendly. Will be back, hopefully in summer next time. Our stay was amazing!! The owner was incredibly warm and welcoming!! The property is beautiful and the attention to detail was amazing! The owner placed fresh flowers throughout the house, did our grocery shopping and delivered it, and provided coffee/cinnamon bread. Our stay could not have been better!! The lighthouse was as described. It had a great view and everything we needed. Nice and clean. Would definitely consider staying here again. Beautifully decorated and well appointed home with spectacular views of Lake Superior. We had a wonderful and very relaxing time. Hiked several nearby trails and enjoyed the scenery and nature. The home is wonderful and we spent many hours on the 3-season porch enjoying the gorgeous sunsets and passing freighters. Will definitely be back. Only superlatives suit this property! We love it so much, we have made a tradition of a Lighthouse weekend in the fall. The home itself is flawlessly and thoughtfully decorated and maintained, and the setting is breath-taking. We watch eagles cruise the lakeshore and river. Lake Superior is steps away and an ever-present companion there. The walking-distance away Fitz offers an excellent menu, and nearby hiking and just exploring the historic town is endlessly interesting. The whole experience from beginning to end is relaxing, enjoyable and refreshing. My overall impression was an exceptional place to stay for vacation. We were there with three couples. Very modern renovations with every amenity you need on site from ziplock bags to cleaners to flashlights to you name it, except the food you eat. The beds & showers were my favorite. Meticulously cleaned, maintained, and intriguingly decorated for relaxation and nature's experience. A highly recommended place to stay, we loved it! Eagle River is a tiny village rich in the Keweenaw's copper mining history. East and West Main Street remain true to their 1850's roots with former hotels, saloons and stores carefully restored into residences. The town sits on the sandy beaches of Lake Superior. The actual Eagle River bisects the town with grand waterfalls, rocky ledges and historic bridges converted into pedestrian walkways.